Meghan McCain didn’t know that Ivanka Trump and Jared Kushner would attend her father’s funeral – and she wishes they hadn’t. “I didn’t actually think about who would be attending the funeral, strangely,” McCain said. “The answer is no, I did not know they would be attending his funeral. © © Copyright 2019 The Herald-Mail. All rights reserved. Had it not been for Sarah Palin, McCain’s Presidential campaign would be just as irrelevant as Mondull’s, Beatle Bailey Dukakus. AlGore and Lurch Kerry’s. Remember, just like Kerry, McCain dumps wife #I for a ‘sugar momma’. Fortunately, the former Senator has no coattail’s and Meaghan will continue sliding into oblivion. Same goes for the Clinton Cypher, once POTUS BJ and the Hunchback of Chappaqua assume room temperature. And he tossed Palin under the bus halfway through the campaign! What a tool! I agree DL. If it wasn’t for Palin’s popularity, he’d not have even got 40% of the number of votes he did imo.. The entire McCain family is a bunch of LOSERS. Megyn McCain was nearly correct. Jared and Ivanka, NOR ANYONE ELSE should have shown up for the funeral of the unprincipled, self-serving, EVIL John McCain! McCain lived a life of NO CHARACTER – and his family either adopted the same lack of character (Cindy McCain knowingly engaged in an affair with John McCain prior to his divorce) or it was her nature all along! Megyn McCain, like a broken clock is right twice per day, but wrong the vast majority of the time! It is my opinion that Meghan, the “FRUIT” of John McCain’s loins, is nothing more than a vindictive little biatch. If we all ignore her maybe she will go away. Turnips like her, seldom go away just cause they are ignored. THEY just seem to get more and more shrill..
Dear Megyn, Most Americans revere your father as a war hero. On the other hand most conservatives regarded him as a RHINO. Sad to say, but his dislike for the president was sad, and I believed it caused him to oppose many plans and bills the president supported. This did not serve your dad well politically. I was one who revered your dad, and was dismayed at his political actions in his waning years!!! Deaf, dumb, blind, stupid, bitter and senile just like her dad. Her bitterness will only hurt herself. I wonder how she rectifies Creepy Joe Biden rubbing all over many women & children in a creepy way? “….I’m not going to forget….” Hmm, pretty sure it isn’t the Trump family with “the problem!” As others have noted, the ole apple falls not far from the tree. McCain’s ‘lone’ vote, for obvious seething spite, torpedoed the attempt to unload that ‘unaffordable’ AHC, a.k.a. Obamacare, mess. He was far too often on the wrong side of issues to have been an actual “conservative.” ‘Self-aggrandizing RINO’ should be on his headstone! Megan Mc follows in her fathers liberal footsteps … hate and discontent go a long way in the Democrat Socialist Party . I saw McCain on TV when he was running for president and heard him say they wanted me to sign a confession, “I told them to get me to a hospital and I will sign anything”. McCain was injured from ejection from the plane. John McCain collaborated with the enemy from day one. He made 32 propaganda tapes for them and may have gotten many other veterans killed with his actions giving away secrets. We need to have McCain’s records declassified and the truth made known for all to see. McCain won’t allow it. McCain blocked searching for POWs and MIAs many times and there were other POWs who wanted their classified records opened so the public could see them, but McCain wouldn’t allow it because his would be opened as well. He has plenty to hide. W.W. II Veteran, First Cav. Div. John McCain lied to me personally and to Arizonans and Americans. I wouldn’t have gone to his funeral unless I could have peed on this casket. Another Mc Ain’t cretin. Still bitter , still nasty and just another chip off the old blockhead. When he ran , I voted for Sarah the true Maverick Republican who cleaned up her party in Alaska and not the phony RINO who sold out his fellow POW’s. I too am a ‘Nam vet and I did not support Mc Cain or even like the guy. I abhorred his persona and his attitude toward Sarah proved him to be a total jerk . Meghan should be glad that the Trump family showed up because they showed her how to be decent….but she doesn’t get it. McCain destroyed his own legacy because of his fury that Trump won the presidency where he had failed. Sadly, Meghan continues her father’s bad behavior. They are both RINOS who do not belong in the Republican Party. McCain’s edict that President Trump be excluded from his funeral reveals his fear that Trump’s presence would overshadow him, even in death. The Trumps have nothing to apologize for, but Meghan needs to grow up and detach herself from her father’s coat tails, starting with behaving like an adult instead of a nasty little girl. Sometimes she shows real talent, but it is diminished by her inherited hatred of President Trump. Grow-up you thankless brat! Trump’s family was there to pay their respects to your father, not give you more cannon fodder for your thoughtless self-serving diatribe on TV. First of all read the Hilton Hanoi. It was written by Robbie Robertson the senior officer at the Hanoi prison John McCain was a prisoner. The North Vietnamese prison personnel savaged the American prisoners because Ho Chi Minh ordered it. John McCain was singled out for extra brutality because his father was a four star admiral. I won’t recount the savagery they inflicted, but it didn’t stop until Ho Chi Minh died. John McCain did cause the explosions that blew up 132 crewmembers and pilots on the aircraft carrier the Kittyhawk. McCain’s father Admiral McCain called in every marker to keep his son from being cashiered as an naval officer and sent to Portsmouth Prison for the inept mistake that was blamed on other crew that was hit by the missile McCain fired. The chain reaction from that mistake killed all those crewmen. Three crew chiefs on deck testified that they saw the missile fired by McCain’s A-6 that hit the F-4. I don’t know if it was karma that caused his plane to be shot down over north Vietnam, but he spent a long time being tortured unmercifully even after he was beaten down and broken. Robertson, who wrote about the torture at the Hanoi Hilton was an Air Force brigadier general and he had no axe to grind against McCain. Those that claim he got special treatment are simply making that up. Karma is a biotch. Ungrateful wretch. Trump did not have to send Prez airplane to transport McCain body back & forth to DC so he could receive the rare honor of lying in state that Ryan, Schumer & Pelosi decided he deserved which I believe they did just to get back at Trump. McCain family requested AF 2 and Trump agreed despite the petty public insult & disrespect toward Trump that McCain had indulged in. McCain may have had form of Stockholm Syndrome since at least in recent years he inexplicably took several positions in defense of our known enemies re: Huma Abedin, Obama, Clinton very close ties & sympathy toward Muslim Brotherhood terror org and his own support & pics smiling alongside FSA terrorists in Syria. McCain military service deserves no more special recognition than any other of the thousands of POW survivors, much less those that died or suffered terrible injuries in defense of this country. Nor does his hypocritical pretense of being a conservative in Congress deserve honoring. Meghan is not the only daughter who profoundly loves her father despite their flaws but that gives her no right to publicly express personal hatred & vindictiveness toward the Prez, who happens to also be a beloved father, or toward Prez family who have been nothing but respectful of her father. The entitled vindictive little pinhead knows nothing but bitterness and revenge and she will never know anything else, because she doesn’t want to. The US is better off to forget her and her mother, simply ignore them; we’ve already “forgotten” the “canary”. 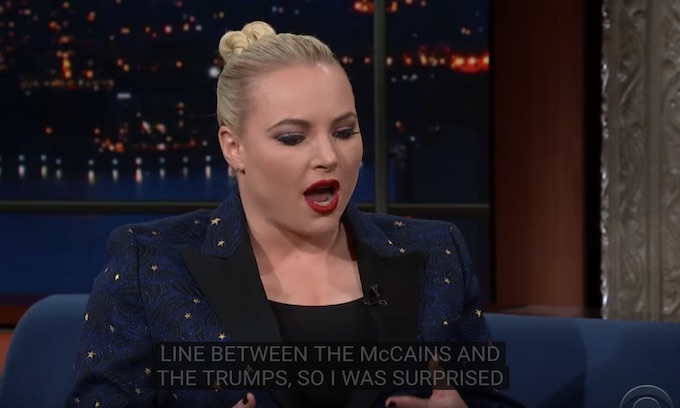 I’ve got news for Meghan McCain, her father was a dishonorable person. If she’s angry and holding a grudge against people who came to show respect to her father (incredible in itself) and who did absolutely NOTHING to her personally, then she has SERIOUS issues. She must be a miserable person to live with that much unforgiveness. What a great legacy her father left her. She should change her party to democrat. She seems to relate more with them. Meghan got the self-righteous, bitter gene. The first is John McCain’s failure as a father, otherwise he should not have been passing down vitriol and hate to his daughter Meghan. Teaching one’s child the Right Thing To Do is paramount in the responsibilities of any parent. The second is Meghan McCain’s decision to continually learn negativity and profess it every moment it seems fit. Hate is a taught/learned thing; it won’t fade from our society until this process stops, either by the intent of the teacher or the refusal of the student. Since John left his wife, i am not sure how much “Raising” of Meghan he did.. This bitter old broad would complain if The Lord himself attended the funeral. Can’t please these people so why even try. By the way, this family requested that the “Trumps” not attend. Well, the “Trumps” didn’t attend…..the “Kushners” did. Well, she’s a rabid commucrat. God’s not allowed.